Watts 1965. Photo by New York World-Telegram. This week we will examine the dynamics of social unrest, the factors that contribute to it, and the solutions some governments use that may help or hinder the problem. I lived in Watts in 1963, two years before the riots of 1965. My family moved to South Central Los Angeles before the riots began on August 11 when Marquette Frye, an African American, was pulled over on suspicion of driving while drunk. 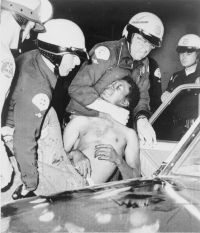 The tension between the police and the citizens in Watts was palpable at that time which was the era of Governor Pat Brown, Gerry Brown’s father. It was the largest and costliest rebellion of the Civil Rights era. As a child, I still remember the days of the riots. The huge plumes of smoke, filling the air with an acrid smell, were counted as we drove the freeway. The television was full of images of police in riot gear, but I never really connected the events on television with the fires around me. “They burned the bowling alley,” my father lamented. He grew up around Watts, and some of his family still lived in Watts, so he was right to be concerned. Thirty-four people died, 1,000 were injured, and 4,000 were arrested. It took the California National Guard to end the protests. Governor Pat Brown began an investigation, claiming it must have been outside criminals responsible for the rioting. This proved to be wrong. All the recommendations made by the gubernatorial commission were never implemented. Watts today looks strikingly similar to Watts of 1965. An article In The Washington Post in August 2014 compared the factors leading up to the Watts riots in 1965 to the circumstances in Ferguson and the fact that the more politicians discuss and study the problem, the less that seems to be done to actually fix it. Commissions and studies are launched, but it is only to allay voter concerns long enough to get their votes while the government seems to turn a blind eye to the real issues causing the problem: Poverty, racism and hopelessness within the community. Is there any wonder why riots still occur? In Seattle, as in Watts, the police response to citizens may have actually prompted the riots. The Huffington Post reports the mostly white, urban “protesters” were attacked by police first, spurring them into the frenzy of a riot. The difference between the Watts “rioters” and the Seattle “protesters” seems to be the way it is presented in the media. In the case of Seattle, the people involved are portrayed Huffington Post as “anti-capitalists” and they were quick to focus on the contributory actions of the police as they clashed with the “protesters.” The organization of this particular riot or protest (when it is done by mostly Caucasians) seems to be the use of social media. Social media seems to have a tremendous impact on the way protests or riots are organized, which may be a unique element in the riots of today. The American Association for the Advancement of Science’s reporter John Bohannon examines a recent study that aims at predicting protests and how they might erupt into a riot by monitoring social media. He interviews one of the researchers of the study, Dan Braha, a social scientist from the New England Complex Systems Institute. He identifies the key components that may tip off authorities to the origins of a riot. Aqualus M. Gordon, Ph.D. has a different perspective. In Psychology Today, he highlights one glaring contradiction between the way the media portrays Baltimore and the Tea Party of the American Revolution, which most Americans will remember as a glorious statement of protest: African Americans are not afforded the same consideration for protest as those in the American Revolution, yet there are few patriotic citizens who would deem the Boston Tea Party as a group of “thugs” trying to destroy property. It is precisely this double standard that creates the problem within government. Perhaps, then, the problem IS the government. The Venezuela Daily News explores how violence and civil unrest may erupt from the simple inability to meet basic needs mixed with long lines, and political change is not so easy. In the case of Seattle, the objection was anti-capitalism, while in Venezuela, the problem is the result of the communist-based system being unable to provide for its citizens. The one common denominator in both is an ineffective government that seems to be oblivious to the needs of the people it serves, and growing disillusionment in those being governed. The problem, it would seem, is a lack of accountability in both types of government, and the protests and civil unrest are merely symptoms of the greater problem. Both sides of civil unrest are responsible for the outcome. While government has its faults, the people involved also contribute to the challenge of seeing everything authentically. NPR News reports the misreporting of a man killed by police in Baltimore and how it contributes to the confusion and chaos. While there was some truth to the story (a man was shot and injured), the group psychology that is involved in these situations complicates perceptions, even to the point of Fox News erroneously reporting the death by police. Memory, possibly weapons focus memory, may be at play in this situation, but the broadcasting of the incident may also contribute to the perception of confusion and chaos. Equally, paranoia may be to blame on both sides, as The Atlantic uncovers. When the government uses “mystery planes” to monitor the actions of its citizens, the flames of paranoia can be stoked on both sides. In the case of Baltimore, police and the federal government were found to be using planes to track the activities of people even after the violence was over. This has resulted in speculation of observers that cell phones, movements and social network activity using special infrared technology may have been used. Even if that was not the case, the not knowing produced the hyper-vigilant fear akin to paranoia. It also resulted in a new case for the American Civil Liberties Union. So are the police indiscriminately killing black men, or are the violent protests the result of a series of random, isolated incidents? The Atlantic pursues the answer to this real question by doing a detailed examination of polling data. As one might expect, there are sharp divides in the answer to whether it is one or the other, but surprisingly, both sides of the political argument agree that the actions are not good. Recent events make the temptation to attribute the police deaths to isolated, random incidents far less likely, there is still a sharp contrast between how liberals and conservatives view the problem. For the liberal, it is white privilege, but for the conservative, it is the infringement of basic rights by the state. Does this solve the problem at hand, or just help us all to agree there is a problem? How we see the problem contributes to how we fix it, and there is a vast difference in how it should be approached. If it is poverty being criminalized, address the poverty. If it is the infringement of rights, pull back on police authority. In this case, it may be a both/and solution, rather than the either/or problem. Finally, PBS Newhour testifies to why Baltimore needed to speak up against the violence of police brutality, and how justice can contribute to healing the city. It looks at the members of the Baltimore community and asks them what the problem in Baltimore is and how it can be fixed. In simple, human terms, it presents the raw, straightforward response to the issue at hand. It is a lot of frustration. When people cannot provide for their families, or find jobs, or find hope, venting happens. To correct the frustration, society must be first capable of seeing the problem. That is why civil unrests happens. It is a wake-up call to a sleeping America.